First Group is a public transport company which provides both rail and bus services. It operates mainly in the UK where it has 26 000 employees and also in America and Canada, where there are a further 24 000 employees. In the UK, the bus service is separated into 27 bus operating company divisions. This study focuses on First Leeds, a bus company in the Yorkshire Division. This has 475 buses and 1030 bus drivers. First Leeds is currently implementing a three-year programme of violence prevention and management measures with the intention of preventing violence to its bus drivers. Carrying cash – this risks theft. Angry passengers. There is a higher risk in the afternoon and early evening when passengers are returning from work, particularly if they have had a long wait for a bus. Certain locations or bus termini are particularly at risk from vandals. Drunk passengers and drug users. Fireworks: recently, as a driver was getting into his cab a firework was thrown on to the bus. The driver managed to get out of the cab in time but the force of the explosion damaged the cab, shattering both front windscreens and damaging the assault screen. Firearms: in one incident, a shotgun was fired at the windscreen of the bus. Vile behaviour: youths urinated down the periscope through which the driver sees the top deck of the bus. The driver left his cab to talk to the youths and was attacked by them. Stress and fear which have a cumulative effect on health. Lost time and production because of sickness absence. A negative effect on recruitment because people are put off when they hear about the problems. Financial loss through compensation claims – although this is mitigated by a company-specific sick pay scheme. Using humour to defuse a situation. Don’t carry it in an obvious cash bag. While driving, do not tell other drivers how much you have taken; people might be listening. When depositing money, use well-lit streets; don’t take short cuts. Liaison with police: First Leeds and other organisations involved in local public transport, work with the West Yorkshire Police to prevent violence. Reporting incidents: Incidents are categorised by type. Categories include assaults due to robbery or fare dispute; assaults involving motorists; and assaults involving spitting, vandalism and missile throwing. First Leeds does not record incidents of verbal abuse. The figures help the operations director to detect patterns in assaults. Attack alarms fitted on buses: pressing a button in the driver’s cab activates the alarm and a synthesised voice says, ‘This vehicle is under attack: dial 999’. The loud speaker in the cab points towards the door, so it is loud and frightening to a potential assailant. 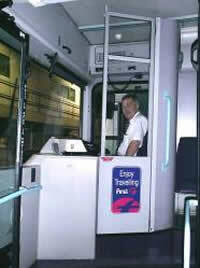 Assault screens: these are fitted in all new buses to separate the driver from the public. Assault screens are see-through barriers which normally cover the area from the left of the driver to the ticket machine. They prevent ‘random’ punches from the public and are effective if the driver sits back as far as possible in the cab. Assailants are at the limit of their reach when trying to hit the driver and are forced to use their left hand, normally the weaker. Both these factors reduce the power of a punch. Communication: drivers can currently use their own mobile phones in case of an emergency but First Leeds is about to fit a special communications device – probably a radio – in every vehicle. The radio will connect to a central contact point at the depot, from which messages can be sent to all drivers. Digital CCTV: very small digital cameras are currently fitted in 26 buses. They constantly record on a 24-hour cycle and replace tape-based cameras which were sometimes unreliable. The cameras are useful in the event of prosecution. Safety film: the company is considering the use of a laminate adhesive high-security safety film on driver cab windows to prevent missiles or shattered glass harming the driver. Some types of film are ineffective so this is being carefully evaluated before it is applied across the fleet. Company sick pay scheme: drivers who are assaulted in the course of their work through no fault of their own are entitled to up to six months on full pay. Attack alarms: Some drivers are reluctant to use attack alarms in certain locations because they actually attract trouble. Also, when a conventional alarm activated the horn of a bus, nobody took any notice of it. Assault screens: There is some concern that assaults screens that do not cover the ticket machine are less effective if the assailant is determined to reach the driver. First Leeds is fitting older buses with screens that fit over the ticket machine. Full screens that fit from the door to the front windscreen have not been fitted because of concern, particularly from trade unions, about reducing drivers’ traffic visibility. There is also some concern that drivers may also act more aggressively if they feel well protected by the assault screen. Radios: these are mostly used after an incident has happened. It is difficult to get assistance to a driver en route, so immediate responses are unlikely. Driver discretion is needed: it is hard to enforce strict rules such as ‘do not get out of the cab under any circumstances’ because some incidents on the bus require a driver’s involvement. It is also human nature to get involved and it can help to calm a situation. Company sick pay scheme: this helps to reduce the risk of compensation claims from drivers but it can mean there is less incentive for drivers to return to work. This may affect the number of ‘+3 days off work’ incidents that are reported to the Board and the enforcing authority. Happy staff: feedback from regular trade union meetings indicates that staff are happy with the supportive approach that First Leeds is taking in tackling violence. Staff are assured that the company is actively trying to reduce risks of assault. Improved morale: attitude surveys suggest staff are happier with the management of health and safety issues. However, it is difficult to prove whether better morale has affected staff turnover. Declining assault rate: between April and October 2001, Leeds First bus drivers reported 62 assaults; in the same period in 2002, there were 43 reported assaults. The reduction appears to correlate with the introduction of the measures. Effective police liaison: partnership with the police promotes better relationships and enables the police to monitor and log bus crime within the police intelligence system. Demonstration to others: First Leeds can show to other members of First Group and the enforcing authority that it is taking action to reduce levels of assault. Financial gain: there is a direct financial gain as a result of fewer assaults leading to less sickness absence. Fewer compensation claims: these can have a huge financial impact on the company. Having fewer claims is very important, although this was by no means the main reason for First Leeds’ anti-violence programme. Be the first to comment on "HSE Work-related violence case studies"